Select your hue, select your experience. We’ve organized our strain library into a range of hues that correlate to their experiential nature. Find the hue that resonates with your desired experience below, and click through to learn more about the strains we offer within that family. These are the high-THC strains most consumers have been taught to associate with the word “sativa”. EMBER strains are heady, strong, stoned. Also known as: what you’re probably reaching for on a Friday night. A GOLD strain is a special thing. These high-THC strains come on with a giggle and bring a warm sunshine high that transports you up up up away from your body to a sense of almost childlike happiness; bright, light, rare. Also known as: tears running down your face from laughter, wind in your hair. Also known as: grinning from ear to ear, with a heart of gold. These heavy-THC strains are what most consumers will associate with the word “indica”, offering physical and often also mental relaxation. A softening, stress-quieting, solid dose of stony calm provides you with a chance to slow down. VIOLET strains are body, chill, meditative. Also known as: your hunched shoulders melting down away from your ears. Also known as: a close friend to workaholics, insomniacs, and/but also to the chillest stoners you know. These higher-CBD strains are connective, reassuring, and encourage an internal stimulation to root, heart, heal, feel. Also known as: a deep, centering breath. Also known as: a means to begin taking ownership and advocacy for our own spiritual and mental wellness in times of elevated stress, anxiety and low mood. Did you know there are cannabis strains that can act as muse, motivator, instigator for invention, and conduit for conversation? PINK strains and blends encourage you to wonder, inspire, create, debate. Also known as: remembering your love for brining your ideas to life with your own two hands. Also known as: deep diving into, around, over, and under conversations with those who challenge, engage, and enthrall you. There is a true joy that comes when you feel present and connected, strong and free in your body. SUNLIGHT strains have a CBD:THC combination that has a way of opening channels between your mind and body that reinvigorate your desire to move and explore and take advantage of the ways you can connect your physicality with this rising excitement and lightness. Bright, euphoria, go, do, see, be! Also known as: a permanent fixture in your outdoor adventures/a good natured push out the door. Also known as: a way to encourage, celebrate, or even help yourself remember to play. Think of MARINE strains as VIOLETS with the added benefit of CBD. This means you still reap the physical relaxation and softening to allow the body to heal, but without THC being the primary player, the mental effects aren’t quite as sedate/stony/heavy. Chill, recover, rest, unwind. Also known as: your hunched shoulders melting down away from your ears while you finish up some personal projects at the end of the way or finally have time for that book you’ve been meaning to crack. Also known as: a way to unwind with your friends or your Self at the end of the day, without bringing the rest of your day along with you. And now, for something a bit different. 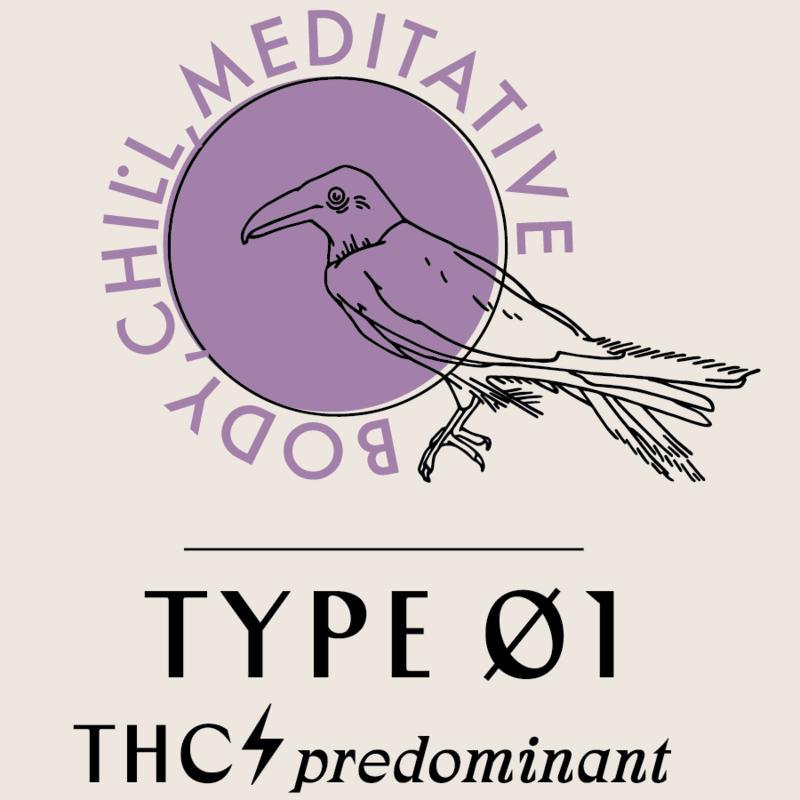 MOON strains are currently the sole hue for our heaviest-CBD ratio strains that fall in the Type 03 category. These strains carry very little THC and may feel quite subtle to some users due to their low to no psychoactivity, which is the most common effect most of us have come to associate with the cannabis experience. The effects they do provide are no less valuable or significant. Heal, easy, balance. Also known as: a chance for your body to use and benefit from the wide range of therapeutic effects the other chemical constituents of cannabis [predominantly CBD] have to offer, without feeling stoned. Also known as: a gift.